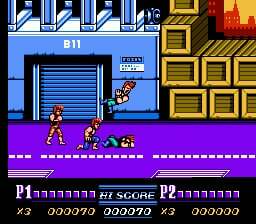 When Double Dragon first hit the arcade scene back in 1987, it was immediately lauded for its intense beat 'em up gameplay and slick visuals and soundtrack. After making pit stops on a number of platforms, the NES included, the game only grew in popularity. So it was only natural that a sequel, Double Dragon II: The Revenge would come along. And while many die-hard NES fans will still claim the original was the best, its sequel has some solid additions too. Since Double Dragon II is still basically a beat 'em up, you're still going to spend the majority of your time taking down a never-ending barrage of enemy fighters bent on knocking your block off. But unlike the original Double Dragon, the controls have been tweaked a bit to make close quarter combat a bit more fair and balanced this time around. Now when you press the "A" or "B" buttons, your fighter will kick in that particular direction of the screen, allowing you to pull off some killer combos and at the same time be better prepared for those times when you're under attack from both the front and behind. Performing a jump or special move, depending on your proximity to enemies, is as easy as pressing both buttons simultaneously. 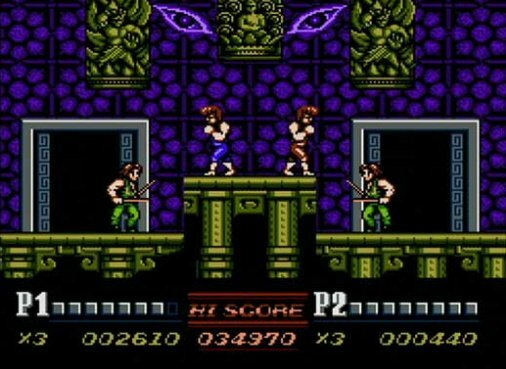 Whereas the original NES port only entertained a single player, the follow-up lets two players fight side by side in either cooperative or competitive play. Two friends playing as a Lee brother each is still some of the best co-op fun the 8-bit days had to offer, and a marked improvement over the original port. Even though we're talking about 8-bit NES visuals, there's a lot to be said about the attention to detail afforded the various scenery and characters in the game. Not only are the backdrops extremely details and colourful, the characters are equally well-designed and animated as well. Double Dragon II basically takes everything that was great about the original title and then adds in a few much-needed fixes. The gameplay is smoother and less cheap and there's quite a bit more variety in not only how the gameplay functions, but also the visual and musical presentations. The game is a tad bit easy, but considering it's still so much fun, it's a small gripe. It's basically a no-brainer for fans of Double Dragon to pick this title up and if for some reason you've never been a fan of the series, this Virtual Console release could very well change that. this game was my addiction when I was alil kid! I don't think that final level is a "tad bit easy" but then again if I played in co-op it might help. ah, river city ransom was one that beat out DD1 due to it's inclusion of 2player as I remember. Cheaper looking but still better with 2. DD2 finally fixed that. My favourite side scrolling beat 'em up EVER! Yes better than Final Fight, Golden Axe, Streets of Rage etc. 10/10 NES game right here imo, so many great memories playing it as a kid in 2-Player. Love It! Best side scrolling beat 'em up EVER! Yes better than Final Fight, Golden Axe, Streets of Rage etc. 10/10 NES game right here imo. Great memories of playing this in 2-Player as a kid. Love it! This is probably still my favorite NES game. Played this a lot when I was a kid. I love beat em up games. Getting this as soon as I can. 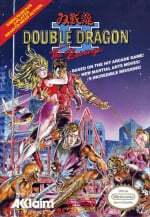 Double Dragon III will probably make its way to the VC. I don't really like that game though. Good old Double Dragon II-talk about Nintendo Club improving the quality of a game-though I can't say for sure how much influence they had on Double Dragon II, it just power-knees the arcade version-a fun game in it's own rite. Now I hope someone releases the Turbo DUO (TG16 CD) version of Double Dragon II on VC. That version is said to be based on the NES and Arcade and is very good, in the same league as the NES version I hear. About Double Dragon III NES version, there is only one problem with that game, and that is the lack of extra lives (should have been an option to have more), that is what hikes up the challenge level. Fun, game, very hard. I still can't believe I won it. 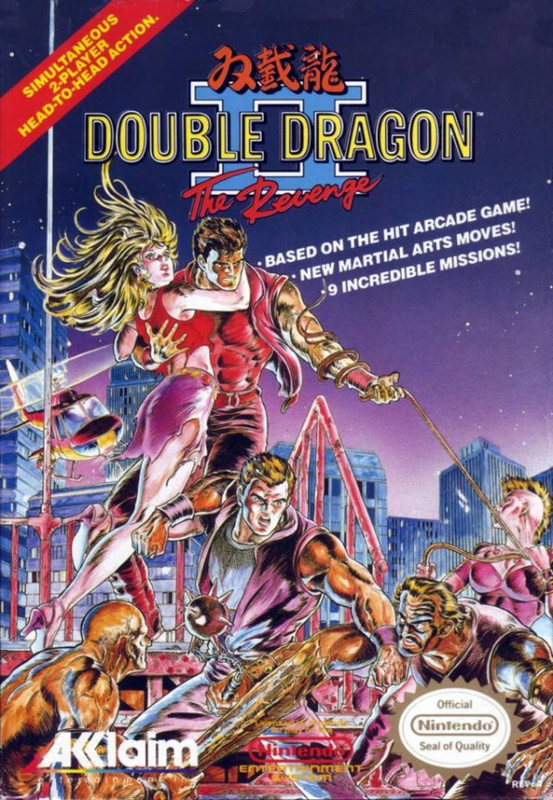 It is hands down, no contest, THE best version of Double Dragon 3. I've played the GB version, and the Sega Genesis version which is close to the arcade version, and they just don't compare. It's amazing how most of the time, NES versions of arcade games were higher quality then their source material. NOW YOU'RE PLAYING WITH POWER!!! 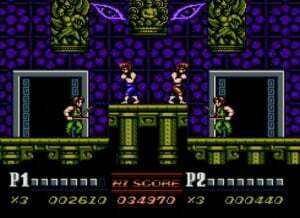 I want now Double Dragon for Virtual Console Arcade. He says next to the screenshot of the hardest platforming section in the game. Great game, way better than the original and WAY better than the arcade version of II. The Nes version of Double Dragon 2 turned a lot of my friends on to the series. However, this one seemed to be the preferred game. The co-op is one of the best around. The spin kick and knee require good timing, but once those are learned, the fun really begins. This will be the first VC game I've downloaded since late 2010. Does anyone know if the extra live two player B trick work in the VC version? great memories might actually get this!! I bought this game Sunday, was always a favorite of mine in the arcade an at home as a kid, my son and I played it together for the first time. He loves it, says its more fun than Joe & Mac! Eh, 8 is a fair score. I can live with that. One minor quibble though: as with most home versions of arcade games, Double Dragon wasn't a "port" in the strictest sense of the term, it was an adaptation. There is quite a difference. Other than that, good review. @Ren No, I like the occasional stroll through the park, beating people up. Mostly purse snatchers, flashers, and pedophiles is who I like to beat up. The Wii VC has risen from the depths of Subcon hell and is finally bringing back some wonderful retro suprises. Strider, Metal Slug 3, Mega Man X2 and now Double Dragon II. Things are looking up in Virtual console Land. @MadAussieBloke did you try dd 2 on supreme warrior mode? are you a supreme warrior? do you have what it takes to overthrow the Shadow Warriors and conquer all in a supreme manner? NES greatness... The only thing I will add is I don't see WHAT people see in the vastly inferior NES DD1... It can't hold a candle to DD1 arcade or DD2. What's DD without co-op?? I remember renting DD1 long after I played DD2 and 3... talk about culture shock. Anyway, between this, the arcade, and SDD, they are the best the series has to offer imo. Happy to see this one. I wanted either this or TMNT 2 to play coop with my bro. I do remember the crappy movie and the Neo Geo got a pretty lame fighting game based on it. why dont think bring the original arcade version on the vc instead of this junk? I miss 80's box art. @SNK the arcade version is junk compared to this. This is still one of the best beat em ups around. Now we need DD1 arcade, DD3 NES, Super Double Dragon, and Double Dragon Advance [for 3DS] and we've got the series best. One of my favorite NES games of all time. 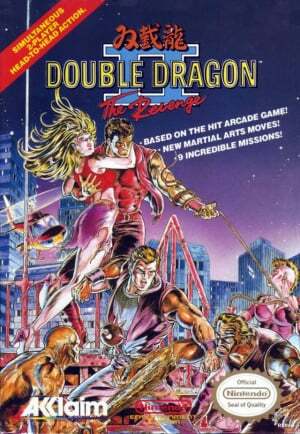 I would love for the 2 player simultaneous Sega Master System version of Double Dragon to come to the Virtual Console. Sprite Flicker and all. It was tremendous fun and a faithful port of the arcade game. This game is awesome, I will buy it eventually. I have such a backlog right now. One of the top 5 best Nes games. why did it take so long to be put on the vc? wow one the best nes games ,and i was lucky to get this with the turtles set christmas1986 (and yes i loved the first turtles game solid but you got your monies worth ,also their was so much different gameplay styles rare even to day.